Arborvitae Ferns are semi-evergreen ground cover plants with foliage that resembles an arborvitae or cedar. Not a true fern, but a lycopod which is a primitive evergreen moss like plant, the arborvitae fern is also called club moss or spike moss. 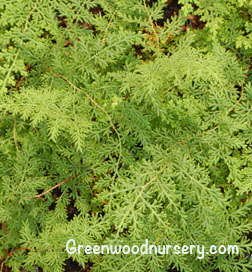 Selaginella braunii proves to be a good companion plant with other ferns, woodland gardens or terrarium plantings. Plant your Arborvitae Fern in partial to full shaded areas. Space plants approximately 2 feet apart. Each plant will mature at about 6 to 12 inches high with a 24 inch spread. Arborvitae ferns require high organic soil that is moist, yet well drained. Water regularly when the top 3 inches of the soil is dry. Container plants should be watered during fall and winter so that the soil does not dry out.